Waterman James Pribram questions the value of a temporary sea wall below the Agate Street beach access project. James Pribram grew up surfing the Agate Street beach break and in adulthood became an environmental advocate, establishing the Eco Warrior Foundation in Laguna Beach to educate future stewards of ocean conservation. His father’s oceanfront home overlooks one of the town’s iconic rock arches. It stands to reason Pribram is a bit territorial about his home break and isn’t shy about complaining over suspected damage to the marine habitat. 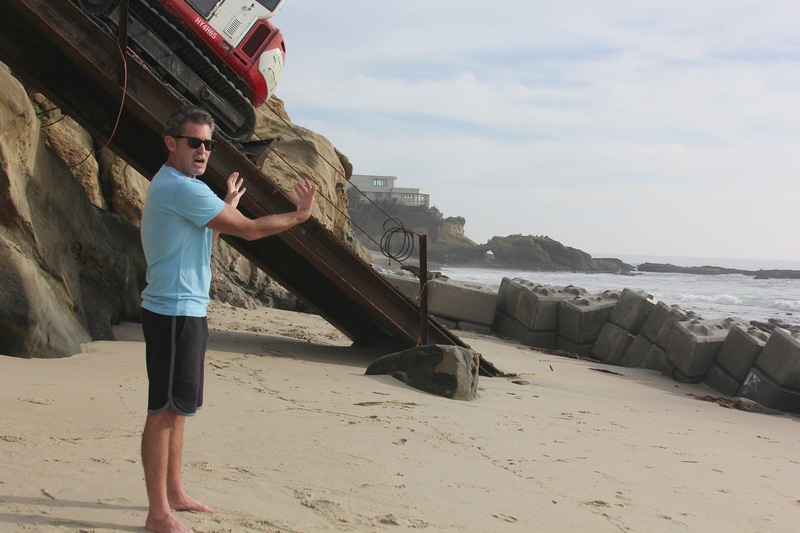 He started asking questions of city and coastal authorities in recent weeks soon after tractors piled up 37 3,000-pound cement blocks on the beach to provide wave protection for an Agate Street beach-access construction ramp. He said he’s fished nails from tidepools, can point to recent chips on the bluff rocks and wonders why the job sits idle for days and workers make no effort to take advantage of low-tide. Agate Street Beach lies within a state marine reserve, a designation that prohibits damage or take of all marine resources, geologic, living or cultural, according to the state Department of Fish and Wildlife regulations. The coastal bluff, though, falls under the authority of the state Coastal Commission, with oversight over land use and local access in the coastal zone. 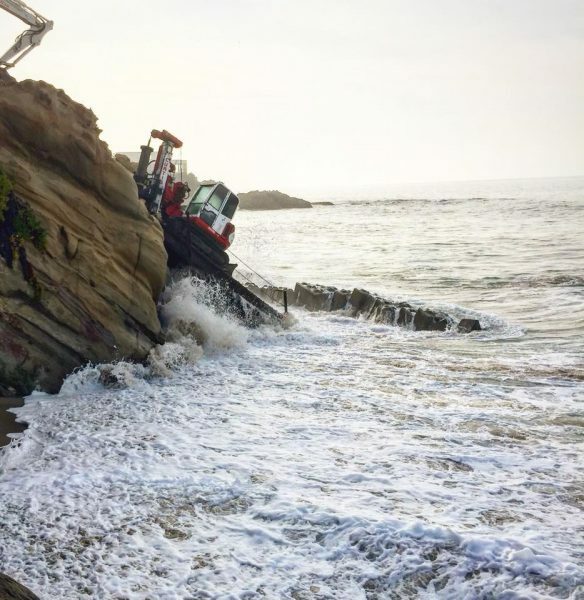 Because the city of Laguna Beach has developed its own Local Coastal Program, a development road map, the city can issue their own permits for projects that comply with the program without seeking Coastal Commission authorization. Approved permits can be appealed to the commission, but the Agate Street project was not, said Noaki Schwartz, a commission spokeswoman. Andrew Willis, the commission’s enforcement supervisor for the Ventura, Long Beach and San Diego offices, said the Agate beach improvements fall within the city’s jurisdiction and does not present an enforcement issue. “All of us know construction projects are messy,” he said. “The city’s done the best they can.” He called the temporary beach obstruction a “trade-off” necessary to protect equipment in order to improve public access. “We all want access and a better stairway,” said Willis. Construction is done in winter to avoid disrupting crowds in summer, even though the beach is broader with more sand in summer months and the blocks would be less of a hindrance, he said. The city’s elected officials approved the project last August, Public Works Director Shohreh Dupuis said. Plans to rebuild deteriorated stairways at four beach-access points have been under consideration for several years and two have been completed. The Agate stairs were closed in October 2016 due to storm damage. Besides replacing the sand-level stairs, improvements to the bluff top include wheelchair access to an overlook and landscaping. “The large temporary blocks are needed for the lower stairs construction and will not be washing out to sea due to their heavy weight,” said Dupuis. Tuesday’s high tide submerged the Agate seawall and portions of the construction ramp. High tides have already tumbled the blocks and Pribram speculates that a west swell and six-foot waves predicted this week could undermine the blocks and ramp. “This isn’t doing anything; it’s a hazard and an eye-sore,” he said. As a retired builder after some 40 years, overlapping into my current profession as an enviro-consultant specializing in land use and regulatory compliance, this confrontation is a result of a poorly understood process. (1) Beachgoers have complained for YEARS about this “Stairway To Nowhere,” as the previous one during certain periods ended well short of the sand: Hence people were stranded, either took a literal “leap of faith,” at risk of physical harm due to that gap distance, or were forced to use either CENTER or BLUEBIRD. Now we’re hearing/seeing one complaint by an unknowledgeable person who expects everyone to jump, reverse or alter a strategy that was signed off on, as noted by the CCC’s Andrew Willis. (2) Must be news to the one distressed complainant, but FIRST you must demolish, THEN create/secure a safe, resilient construction zone…Note these blocks are temporary, NOT permanent structures or just allowed to roll around willy-nilly, pell-mell. (3) We used a metaphor during construction activities, especially with demolition elements: Like an omelette, eggs must be broken, moreover at times adjustments are made DURING removal/installation. (4) The complainant’s parents live close nearby, were probably notified of hearings per CEQA, as the Project was also posted at the top of the stairs landing per local/state regulations. I saw & read it, went to the City’s website, and I was satisfied that it was basically a reasonable solution to a long-standing unsafe and unacceptable Coastal Access issue. As critical as myself & my NGO, Clean Water Now has been over our 20 year history, in this instance where the City finally responded (albeit we feel slowly, we have frustrated friends & family that demanded a remedy), the installation (after 2 site visits recently) is acceptable to industry and obviously CCC standards. Looks more like one person is seeking MSM attention: I’d point out that no one else (though highly trafficked hence high profile site) has filed a complaint or formally petitioned via an administrative grievance. Personally, the Project’s not as invasive nor housekeeping as slovenly as alleged: This is why God made iPhones, take photos, document complaints/violations using a GPS stamp that secures time/date/exact location of said evidence, even procure eyewitnesses. We have none here. I think one important lesson is to read posted notifications. Go online or downtown to the Community Development counter, educate yourself as to the Project, its purpose, its duration, the Best Management Practices proposed, etc.. The Marine environs is important, fragile, so yes, be more vigilant: But educate yourself before you go off half-cocked. The answers, the reasons for certain logistics that seem unacceptable/irregular might already be there. Land Use is a boring topic, but it’s where the rubber meets the road regarding planning, where your City is going. After being out of the country for two weeks we walked the wonderful sands of Pearl St and came upon this unsightly, dangerous and downright unacceptable displace of “eggs must be broken” display of antiquated ingenuity. I’m on James’ side: this is ugly and NOT what I’d expect from Laguna Beach which prides itself on environmental issues. Surely there were options other than tons of concrete legos strewn about the beach. Poor planning, poor public notice and poor execution all the way around. And furthermore Robert’s counter seems more of a personal attack than a rebuttal. NOT kosher, cool, uplifting or insightful or any way to display public discourse. Like many in Laguna, you seemed to unable to get beyond an elitist, entitled mindset. As if the City can just wave a magic wand, like a magician remove the old stairs, install a newer, safer one without any intermediary steps…that defines Magical Thinking! Where is your evidence that it was poorly planned, poorly notified, and poorly executed other than your opinion? Do you have proof of those 3 allegations? As for where debris came from, where is the proof that it came from this site? The Cal Coastal Commission is our overseer: I know & have worked with staff, including Andrew Willis (CCC contact point). I think those “legos” are a relatively creative solution to a complex problem: Protecting the site until completion. Nowhere do I see/read any expertise on the complainant side, no background performing beach front improvement/rehab projects. No General Contractors with such difficult installations. Bring a problem? Then bring at least one alternative solution. So for all of the outraged brainiacs, not one attended hearings (where they could have provided input) nor anywhere do I see someone who made written comments, introduced testimony proactively. And please, Mr. Shraff, you spot it you got it: You allege a personal attack where a professional builder & now analyst encourages the public become engaged early on in the process, implement their rights. If one of THE most protective Laguna-based, watchdog NGOs in the past 20 years doesn’t agree with you, then that’s no reason to personally attack us/me. No one reading this has time enough to read the online history (MSM columns/interviews, EPA hearings, etc.) of CLEAN WATER NOW. We in fact were THE South OC award-winning beach cleanup program from 2000—2013, I’ve got the certificates right here, signed by whomever was Chair of the CCC at the time. I was personally certified and administered HUNDREDS of cleanups, from Newport to San Clemente. Like Muhammed Ali said: “It ain’t bragging if you can do it.” We’ve got a self-funded, 20 year grass roots product, a robust archive of protectionism I’d compare to anyone’s in SOC. So if there WERE other options, could Ms. Ross (also wrote letter), Mr. Shraff & Mr. Pribram please provide YOUR plan? Is it not true that empirical data may yield good information that if framed in a technical context is benign ? I will liken it to a highly skilled plastic surgeon that accepts a poor candidate and performs a procedural correct rhinoplasty that concludes with a horrifying result. I also stipulate to the accusation that there exists some territorial issues in which some people feel they are important stakeholders in trajectory of this endeavor, thankfully. The city has compelled the contractor to clean up the work site and the contractor has done a great job in doing so. I hope things move in a positive direction from here on out. Wow, the guy from Clean Water Now definitely seems like he has a personal problem with James. He also seems very interested in talking about his accomplishments-which have nothing to do with the issue at hand. It doesn’t take an expert to look at those photos and realize there has to be a better way. Been in construction my entire life. Never seen such inefficiency, negligence and incompetence. The previous stairs lasted 45 years and were built before we had “Pong”… I predicted this would be a debacle and it has exceeded my expectations. The workers cook up food between showing up after 10:00 and leaving after lunch. Nice guys, just no direction. Never seen a foreman or an engineer guiding workers or even a set of blueprints. Just 2 guys eating, watching surfers and moving stuff around to look busy. Been on a lot of job sites. They don’t have to be “messy”. A well run job site is cleaned by quitting time every evening. This should be especially adhered to if the environment is involved. They’ve only started to straighten things up after James started getting involved. At this point I suggest the city create a view deck with no stairs as they obviously seem difficult to build and will always be treacherous at the bottom. People can walk down Pearl or Bluebird. Roger, the “Legos” do nothing. It’s a bad solution. It got implemented on a theory, but now in practice they are a joke. We have video and we can’t display it on this forum but it is displayed on James and many others Facebook pages. In my letter I created a “solution” you asked for, simply omit the stairs, they were always a liability and always will be. Create a nice view deck and move on. As for your defense of the construction crew, I’m there on the daily and it appears Agate is the neglected project, with barely a worker there any day of the week. We have a longstanding joke of pictures of an empty work site after 10:00 on a Monday or any day of the week. We also talk to the workers, on the off chance they are there and they only tell us, “one step forwards, two steps backwards”… Now the computer is broken on the drill rig and a specialist has to come fix it, so they chained off the area and were gone by 10:00 Friday. Not arguing with you, just stating the facts. I agree with everything Chad Gibbs says so well . One of the best points he makes is that the bottom of the steps will always be treacherous. There aint no way to change that. Thanks to James, the City has acknowledged that there is a problem and has started to implement a clean up plan. (1) I included my portfolio & that of my NGO to establish credibility, just as Mr. Pribram has. In another MSM outlet he beat the drum of his 5 year history of beach cleanups. (2) I’m wondering how many of the posters here are friends of Mr. P.’s, were called/notified of my comments, asked to rebut by him? (3) Perhaps NO STAIRS would have been the correct solution? Under CEQA, the City should have considered a NO PROJECT alternative…….they traded a lengthy under construction situation, expensive rehab when all they’ve done is just install a less hazardous stairway—-They didn’t eliminate the injury exposure. This is a mini-point/promontory, the most vulnerable access/egress point regarding sand depositions and tidal extremes. (4) By moving and not replacing, visitors would then use the 2 most reliable ones: Bluebird & Pearl…..those who noted this have sustaining condition evidence.